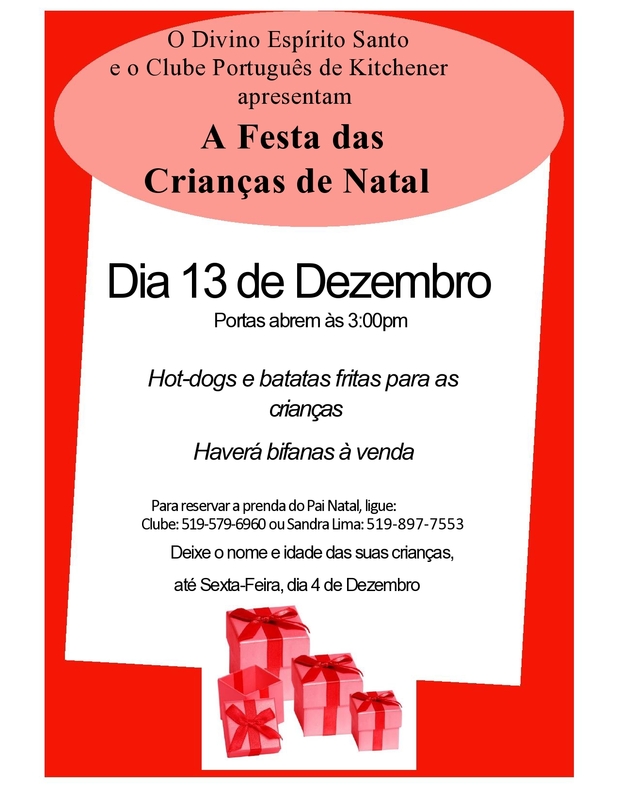 Christmas | Kitchener Portuguese Club Inc.
Posted in: Past News and Events. Tagged: 10th, 2017, Children, Christmas, club, contact, December, Divino, Espirito, Gorete Baptista, Hosted By: The Our Lady Of Fatima Parish, KITCHENER PORTUGUESE CLUB, Main Hall, Party, Sandra Lima., Santo, Sunday. Children’s Christmas Party – Sun Dec 10th, hosted by the Our Lady Of Fatima Parish, the Kitchener Portuguese Club and the Committee of the Divine Holy Spirit Kitchener, in the Main Hall of the Portuguese Club of Kitchener. the Club: 519-579-6960, Sandra Lima: 519-897-7553 or Gorete Baptista: 519-896-6163. Deadline for registration: Friday, December 1st. Posted in: Past News and Events. Tagged: 11th, Children, Christmas, club, contact, December, Divino, Espirito, Hosted By: The Our Lady Of Fatima Parish, KITCHENER PORTUGUESE CLUB, Main Hall, Party, Sandra Lima., Santo, Sunday, up to 10 years of age. Children’s Christmas Party -. Sun Dec 11th, hosted by the Our Lady Of Fatima Parish, the Kitchener Portuguese Club and the Committee of the Divine Holy Spirit Kitchener, in the Main Hall of the Portuguese Club of Kitchener. Deadline for registration: Friday, December 2nd.